The tree-eating Asian Longhorned Beetle or “ALB” infests maples and many other trees, threatening New England’s forests if it spreads to them. These invasive beetles are big, black, and shiny, with bright white spots. They are ¾ inch to 1-1/2 inches long. Look for them in the summer and fall. 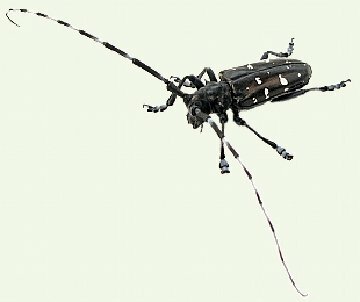 The invasive tree-eating pest, the notorious Asian Longhorned Beetle (Anoplophora glabripennis), or “ALB” for short, has recently been detected in neighboring Shrewsbury, making it a good idea for Westborough residents to be on the lookout for these large beetles or signs of their activity in our trees, especially maples. This was the message from Jennifer Forman Orth of the Mass Department of Agricultural Resources (MDAR) in a March 14 presentation about the ALB at the Westborough library, arranged by the Westborough Community Land Trust (WCLT). Jennifer should know. She has been in the eye of the storm created by the discovery of the ALB in Worcester in August 2008. She remembers the late Friday afternoon when she got the phone call to MDAR from the concerned Worcester resident who first reported a possible Asian Longhorned Beetle in her yard. Jennifer spoke at length with the woman and in the early evening received two cell phone photos of the beetle. They were a bit fuzzy, as cell phone photos often are, but still, Jennifer could see four identifying characteristics that enabled her to positively identify the beetle as an Asian Longhorned Beetle. By the next morning, Saturday, Jennifer was one of four officials checking the resident’s yard in the Burncoat area of Worcester. “Asian Longhorn Beetles were just falling out of the tree,” Jennifer recalled. Since then, the regulated area or “quarantine zone” containing the ALB has expanded from the initial 17 square miles established in Worcester to 110 square miles, including Worcester, Boylston, West Boylston, Shrewsbury, and parts of Holden and Auburn. (For a map, go to http://massnrc.org/pests/alb/.) The area has expanded as trained crews from federal and state agencies have inspected trees – two million so far – and found the ALB farther and farther away from where it was originally detected. So what’s so bad about the ALB? It kills trees. More precisely, its immature “growing and eating” stage, the caterpillar-like larvae, eat living trees from the inside out. The larvae chew their way deep into a tree’s heartwood, develop into adults, and then eat their way out. As with many insects, the population grows exponentially, killing the tree over a period of years. “There is no cure once an ALB infestation starts in a tree,” Jennifer said. “It may take more than a decade for the tree to die, but it is doomed.” In the meantime, the ALB infestation will spread to other trees in the vicinity. For this reason, infested trees are removed promptly. Each adult female beetle lays 40-90 eggs in a season, often on the bark of the same tree where the female herself hatched. The eggs hatch into larvae that tunnel deep inside the tree and eat and develop while protected there. Even woodpeckers can’t get at them. In the Worcester area, 30,000 trees have been destroyed in an effort to prevent the spread of the ALB. The ALB has broad tastes in trees. Its favorites are some of our favorites – the maples, including sugar maples, red maples, silver maples, sycamore maples, box elders, and the Norway maples that have been planted extensively as street trees in our area. But it also attacks other common trees in our area, including gray birch, paper birch, Siberian elm, American elm, weeping willow, black willow, green ash, American sycamore, horse chestnut, and poplar. Also on its menu are European mountain ash, common hackberry, London plane tree, golden rain tree, katsura, and silktree. Exit holes like this one are a sign that the ALB has infested a tree. Now is a good time of year to look for exit holes because there are no leaves to obscure your view. These holes are perfectly round, a bit smaller than a dime, and at least 1 inch deep. ALB adults leave these tell-tale exit holes when they chew their way out of a tree after developing inside. It’s easy to see why officials fear for our forests and the wildlife that make their home in them. From the Worcester area, the ALB could spread into New Hampshire, Vermont, Maine, and upper New York. Many industries could be harmed, including the maple syrup, timber, nursery, and fall foliage tourism industries. What trees doesn’t the ALB eat? Softwoods or conifers, such as pines, firs, and spruces, aren’t on the menu. Neither are oaks. And the ALB spares apple, crabapple, cherry, and other stone fruit trees. The ornamental pear trees planted along Westborough’s downtown streets should be safe from the ALB. How does the ALB spread so widely? Like so many other invasive species, it spreads with the inadvertent help of people. Any wood that’s moved from one place to another can spread the ALB if it’s infested. Major examples include firewood, storm debris, and wood removed after tree maintenance. For this reason, it’s prohibited to move wood out of the quarantine zone. So, as they say in TV crime dramas, “be on the lookout” for the ALB in your yard and neighborhood, and in Westborough’s woods. It could be here already without our knowing it. The time to look for adult beetles begins in July, when new adults start to bore their way out of trees to mate, lay eggs, and eventually die by November. But signs of ALB activity are visible year-round. How can you recognize the ALB? First of all, these beetles are BIG – ¾ inch to 1-1/2 inches long (about as long as the end part of your thumb). Jennifer describes them as “pretty beefy” insects. Next, they have two characteristics that Jennifer could see easily in cell phone photos. They’re shiny black, “like patent leather” according to Jennifer. And they have bright white spots on them. If you find a beetle you think might be an ALB, report it by visiting http://massnrc.org/pests/alb/ or calling toll-free 1-866-702-9938. Jennifer suggests taking a photo of the suspicious beetle if possible, or capturing it and putting it in a jar with a lid. What can we do now, in March? This is a good time to check your trees for damage from the ALB because there are no leaves to block your view. 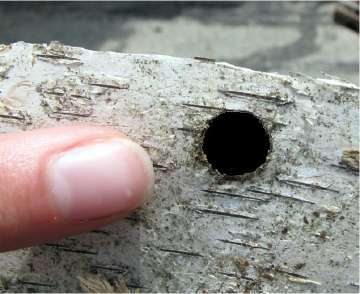 With binoculars and a pencil, you can look for exit holes created when adult beetles chewed their way out of the tree. Trees are generally full of all sorts of holes, but these exit holes are perfectly round and about 3/8-inch wide, a bit smaller than a dime – or about the size of a pencil eraser. If you find such a hole (and if it’s within easy reach), you might check to see if the eraser end of a pencil goes straight in at least one inch. Jennifer recommends looking at your trees around noontime, in full sun, and spending 4-5 minutes examining each big tree. She suggests using binoculars to look at the upper parts of the trunk and branches. If you find possible exit holes, take a photo if possible, and report them using the web site or phone number given above. It’s also possible, but harder, to look for other evidence of ALB activity, such as ALB egg-laying sites (also called “oviposition” sites). They are shallow, round depressions about ½-inch wide that the female has chewed in the tree bark. She lays one egg in each. If fresh (during the summer), they may ooze sap and look orange-colored. Early detection is an advantage in stopping the spread of the ALB, Jennifer said. She noted that the ALB infestation in Worcester had been going on for 12-15 years when it was discovered in 2008, and by then had spread to 20,000 trees. In contrast, a very recent infestation was discovered in 2010 in Boston (reported by a groundskeeper at a hospital near Arnold Arboretum), and it had affected only 6 trees. So for Westborough’s sake, keep your eyes open for the ALB and signs of its activity, and report anything suspicious. If you missed Jennifer Forman Orth’s presentation or would like to see it again, Westborough TV (WTV) videotaped it and will be showing it later in the year on the local public channel (11 Charter/ 24 Verizon).